The higher a company’s NPS®, allegedly the higher its customer satisfaction. This may be true but it is incidental. The key relationship is actually between NPS and revenue. The higher a company’s NPS the higher its revenue growth rate is likely to be. This is the very basis for why organisations use NPS. This is key as he goes on to say how important revenue is later in his article and criticises NPS for not being revenue relevant. On the “allegedly” side, you don’t need to believe me about the link between NPS and revenue, check out this whole page of Net Promoter Score® Success Stories and Case Studies for evidence in different industries and business sizes. 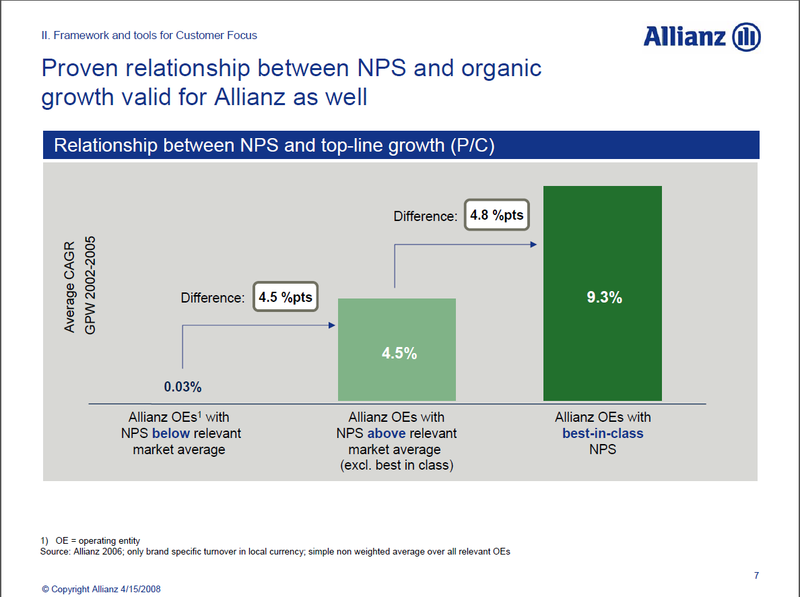 Allianz operating units with a high NPS have a higher overall compound annual growth rate (CAGR) than those with lower overall NPS scores. No one’s denying that revenue is important, not as important as margin, but still important. It would be good if John had explained how to calculate his new “Net Revenue Score” so we could discuss his idea. Maybe in his next post? When a consumer verbalizes a future action (or inaction), it is likely that their subsequent behavior will be consistent with their words. John suggests that you should not ask customers the “would recommend” question, just in case they won’t and then, to be consistent, don’t recommend you in the future. That will be similarly tainted. More importantly, using the Net Promoter approach is not only about asking questions but taking action. Companies who effectively use Net Promoter will be proactively contacting unhappy customers to solve their issues and access the value generated by the Service Recovery Paradox. In this paradox, customers who have a problem with a company, and have it actively rectified by the supplier, are more loyal than customers who never had a problem in the first place. So, far from those non-recommenders being a drag on the business they can actually be converted to loyal customers and be an overall lift. This is a great way to close your eyes to understanding how your business could change and improve to better serve customers. If the whole Lean Startup approach has taught us anything it is: always be learning. Test and learn should be baked into the business process. By not listening to customers with negative opinions you lose a good proportion of that valuable information, reducing the speed of change and chance of success. For instance feedback may identify a segment of customers to whom you shouldn’t market because they will be unhappy and drive negative word of mouth for your business. Far from a negative this is a great outcome as you have improved your understanding of the market. Or maybe you will identify a latent flaw in your product or service that will prevent you from being successful. Regardless, only receiving feedback from happy customers is not a smart idea. 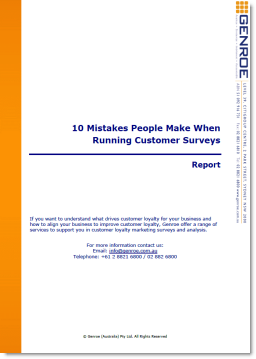 Besides how do you decide which customers will respond positively? There is no practical way to, apriori, know which are the happy customers. An Indirect and Passive Question? Here John feels that the Net Promoter question is too weak to be useful and a more actionable question is needed. Unfortunately he misunderstands the Net Promoter “would recommend” question as a word of mouth marketing measurement tool. It’s not. Instead the “would recommend” question has almost nothing to do with actually generating recommendations for a company. It is all about how the respondent feels about the company in question and therefor whether the customer has loyalty to the company. That is what NPS measures.